The two rockers who adopted the band name Blood Red Shoes, Steven Ansell and Laura-Mary Carter, are from Brighton in England. Laura-Mary once said that the name of the band was infused by the white shoes of actress / dancer Ginger Rogers that had colored blood-red from dancing intensely in a musical. Laura-Mary knows her classics, although to be exact the shoes did not color red in a musical, but in the film Swing Time (1936), in which Ginger Rogers dances wearing white shoes. 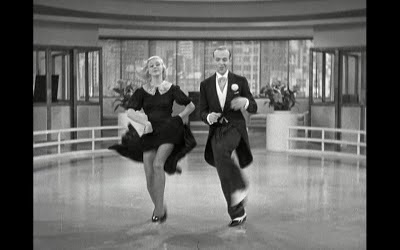 For one of the dance scenes – inaptly entitled Never Gonna Dance – Ginger and her legendary film and dance partner Fred Astaire had to dance the same part 47 times in a day, and as a result Ginger was sweating blood in her shoes, literally. Nevertheless Ginger later declared that, of all films she made with Fred, Swing Time was her favorite. Nice to know: Gene Kelly, a colleague of Fred Astaire, once stated that 'the history of dance on film begins with [Fred] Astaire'.